What's In The Bag, Gajan? This is the day-to-day travel pack. The Creative's Caravan if you will. I always found it very interesting to know what tools other creative minds prefer and why they made the choices they did. Above you'll find the pack I keep in tow on a daily basis. What isn't pictured above is my trusty D800+50mm f1.4 kit. The reason being that I needed it to capture the aforementioned image. Below, you'll find a more detailed explanation on my toolset. Permission to geek out? Granted. 1. Herschel Laptop Backpack - I wanted a backpack that didn’t look like a tank. Something slim and efficient. This one has a good set of pockets and what-not, without making you look like a Himalayan sherpa. Genius. 2. 15.4" MacBook Pro with Retina - Amid strong rumours about a bigger refresh in the MacBook Pro line, I waited. It would be another year before the MacBook Pro with Retina was officially announced. It had me at hello. 3. iPad 3rd Gen - An iPad has become a must-have in my workflow. Aside from the ease of use, battery life, and plethora of media, the iPad makes a killer device to actually create, store, and share creative work. 4. iPhone 5 w/Cleave Bumper - At this point, you see the Apple trend percolating throughout this post. At the end of the day, these are the tools I use for my needs. I love the iPhone for the build quality, availability of support, and the ridiculous amount of quality apps. Sure, I’d love a larger display, but in my honest opinion, great software is more valuable to me than the latest hardware. 5. GoPro HERO3 Black Edition - If you’re not familiar with the product, you’ve probably seen the footage at the least. The HERO3 Black delivers awesome quality footage with it’s unique wide-angle look and is far more portable than most traditional video solutions. Not to mention, this specific model can pump out 2.7K resolution at 24fps. Permission to geek out? Granted. 6. 1Tb Western Digital Passport - Storage space has gone from luxury to necessity. This is always on hand for offloading large data files, providing quick backups, and housing my prized iTunes library. They don’t make iPhones big enough and iTunes Match is limited to 25,000 songs, so I’m forced to have it always on hand. You never know when you’ll need a specific set of tunes for work or play. 7. Nike FuelBand - I’ll be the the first to tell you that you don’t need any fancy technology to stay healthy. However, knowing how active you are and trying to be better every day is a very simple and competitive way to stay active. Not to mention that Nike offers an awesome suite of iOS apps to keep users engaged. 8. Plantronics Legend - Most of the time that I’m out of the studio, I am listening to podcasts where mono audio will suffice. Also, I hate holding a phone to my ear. Yes, I know, first world problems. Sue me. But the Legend provides awesome audio for spoken word and wideband audio for crystal clear voice calls. 9. Evernote Moleskine - Nothing beats paper. Except maybe scissors. In any case, I have my Moleskine on hand for ideas, mindmaps, sketches, and pretty much anything that just has to be jotted down quickly. All the pages are scanned via the Evernote app and saved. The idea is that everything I've drawn or written is accessible physically or digitally. 10. Pencil Case, Markers, Pen, Pencil, Stylus - Fountain pen? German. Lead Pencil? Japanese. Stylus? American. Even when it comes to the simpler tools, there is some truth to getting what you paid for. These things are hardly expensive, just a little above average. But having a pencil that never breaks (Google the Kuru Toga) is just one example of having mediums that lower resistance and allow you to just do your work. 11. Business Cards & Stickers - Always on hand. If you take your business seriously, you’re always ready to drop an elevator pitch and spread the word. Besides, who doesn’t like stickers? 12. Altoids emergency box - Gum, sticky notes, paperclip, blade, rubber bands, bandages, lens cloth, quarters, lighter, balm, $20 bill, and a 32gb USB drive. Yes, all of this fits in a Altoids box. 13. Alpha Brain - This magical supplement provides a good amount of natural ingredients that rapidly increase your overall focus. No, this is not something that’ll have you test positive. Do you research. Results may vary. All I can say is that I have been taking these for months and noticed a measurable change in my productivity. I guess I should also mention something along the lines of consult-your-physician-beforehand. 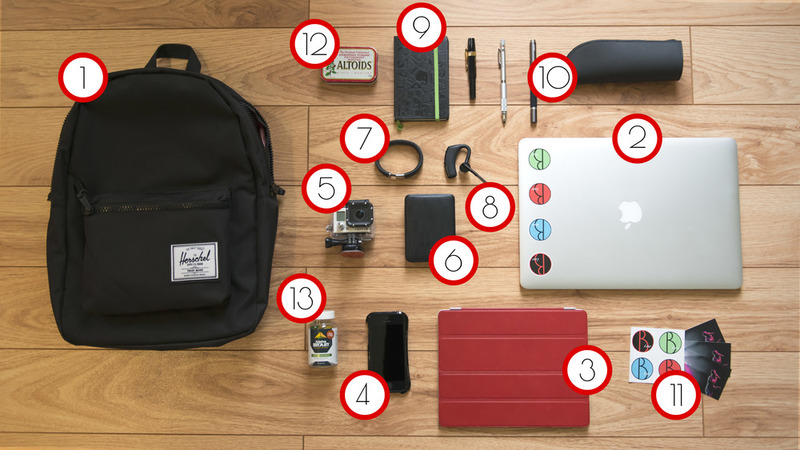 What do you carry with you on a day-to-day basis? What tools do you have on hand to keep yourself productive? Let us know below.